Its almost time for me to leave the Philippines. 1 more week – totaling 5 months. Its gone fast but slow. If that makes any sense. Lately food has been on my mind constantly, there are some good reasons for this, but more so bad reasons. I’ve been pretty lucky living here. There is a lot of great food. Or maybe this is just because I have to eat out everyday versus making everything back at home myself. The luxury of eating out everyday quickly wore off within the first month but thankfully there are so many good places to get food here, i’m not bored of it. The main reason for having food on the brain is I’ve been sick…..bad sick….running to the loo sick……vomiting in a bin at work sick……..because of eating something that was probably not quiet right. I’m not surprised. I was told i’d experience it. I thought I was pretty lucky haven gotten away with it for the first 4 months. But alas, I was struck! And seem to have experienced some dodgy tummy rumblings 2-3 times now! Bring on home!! So if food blogs are not your type of thing, you’d probably want to stop reading now. I felt it only fitting given my history with the food here, I share some pics of my absolute fav’s!! 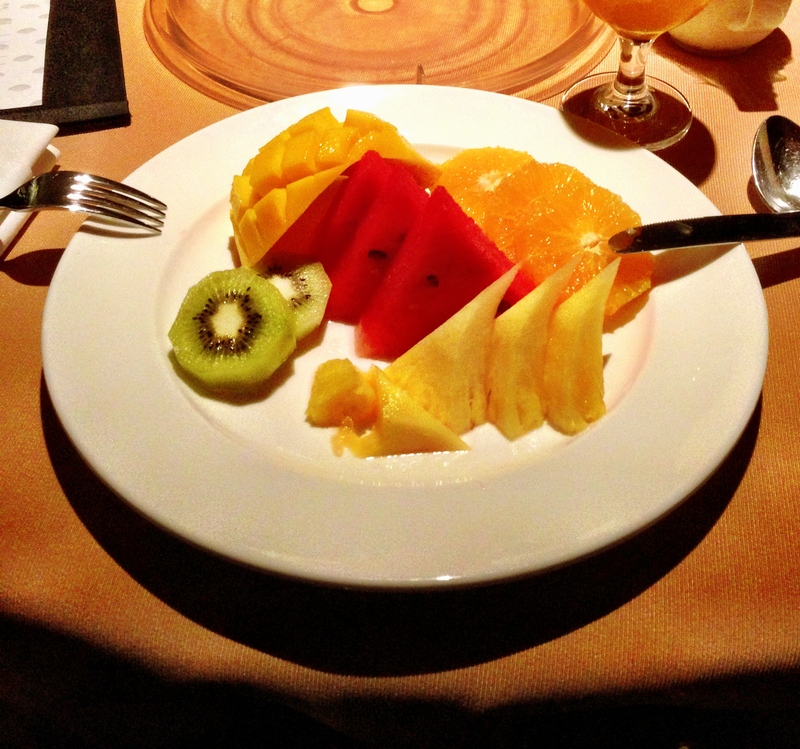 Its only fitting that I declare my love for the fruit in the Philippines. It is always so fresh, sweet and colourful. For the first 2 months, this was my breakfast waiting for me every morning. Isn’t it gorgeous! I am obsessed with the pineapple. I have eaten pineapple EVERYDAY I have been here – even bought a pandora charm shaped as a pineapple as a quick memory of my pineapple eating days in Manila. In the beginning when I didn’t quiet know the area and didn’t feel completely comfortable walking around outside Makati by myself, room service became my friend. 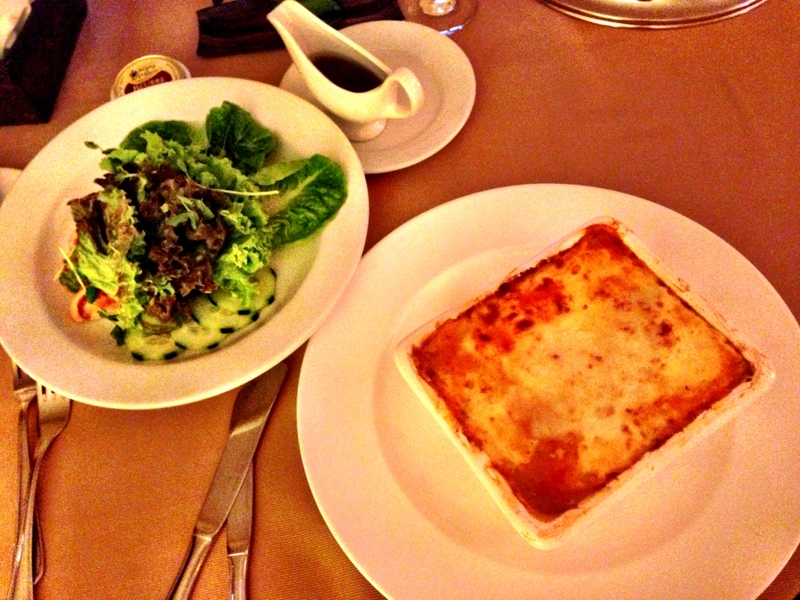 And I quickly discovered the lasagna I was addicted to it. And the serving was HUGE! Now days Its taken a tragic turn for the worse and the chef’s seem to forget it requires a tomato sauce so it comes all dried out with brown mince – yuk!!! But good memories here! Work friends introduced me to a beautiful restaurant called Aubergine. 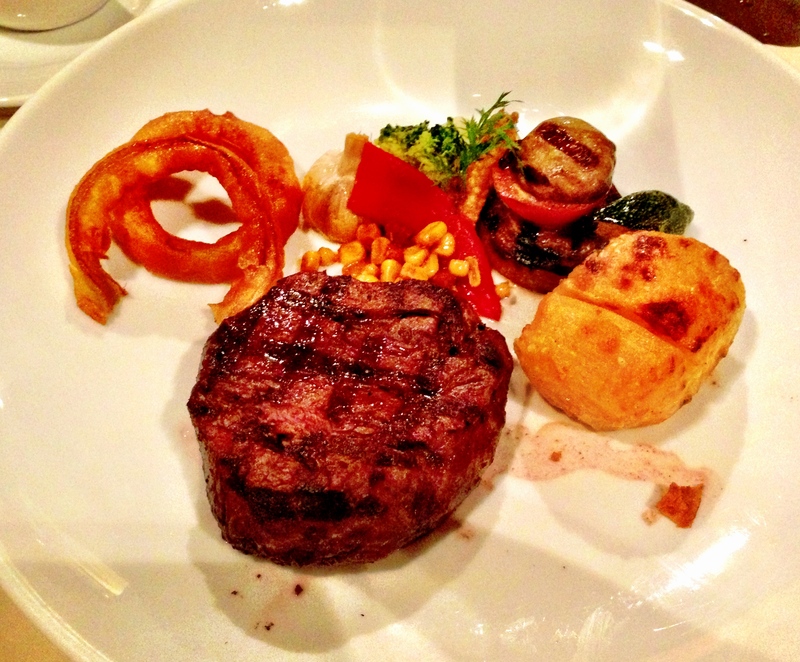 It serves the yummiest food and i’m proud to say makes a great Aussie Steak! There is this little cheap Indian restaurant, about a 10 minute walk from the hotel, called New Bombay. And I LOVE it. This will be THE thing I will miss the most coming home. 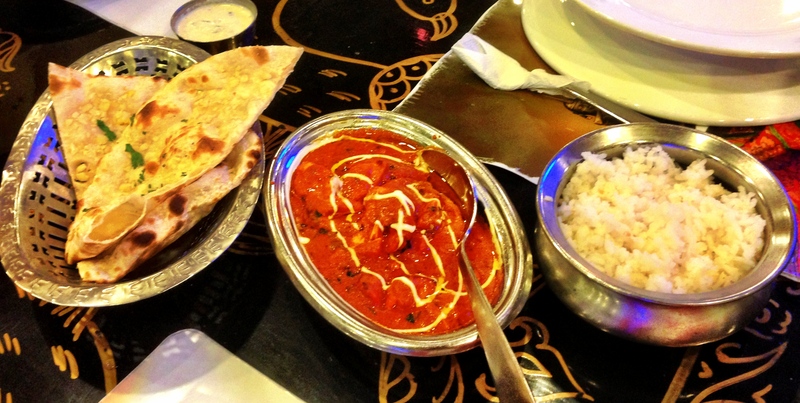 Every time I go, its always ‘Butter chicken, garlic Naan, and plain rice’. Soooo AdIcTiVe!!!! I will miss you butter chicken! For a while there I had the Love/Love relationship with a Mexican chain called Agave. 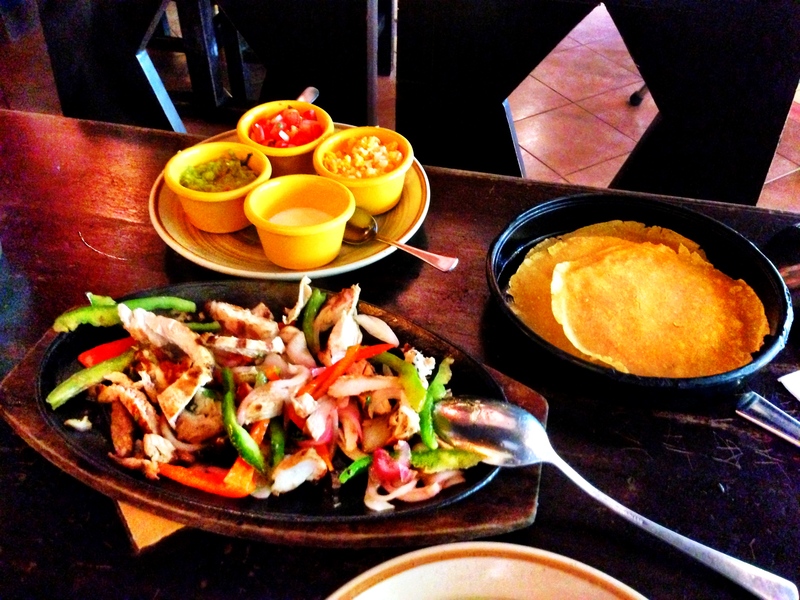 They make the best chicken fajitas with the best spicy salsa. I’d have them once a week but once work became busier I couldn’t go as often. Sadly my relationship with the fajita’s has developed into a Hate/Hate relationship as I ordered them for take out (its called ‘take out’ here, not take away), thoroughly enjoyed them then became horribly sick the next day at work. Lets just say paracetamol+ blue power aid+a rubbish bin became a not so friendly sight at work (vomiting, ewww!!). The gorgeous treats from the business lounge will be sadly missed by my tummy. 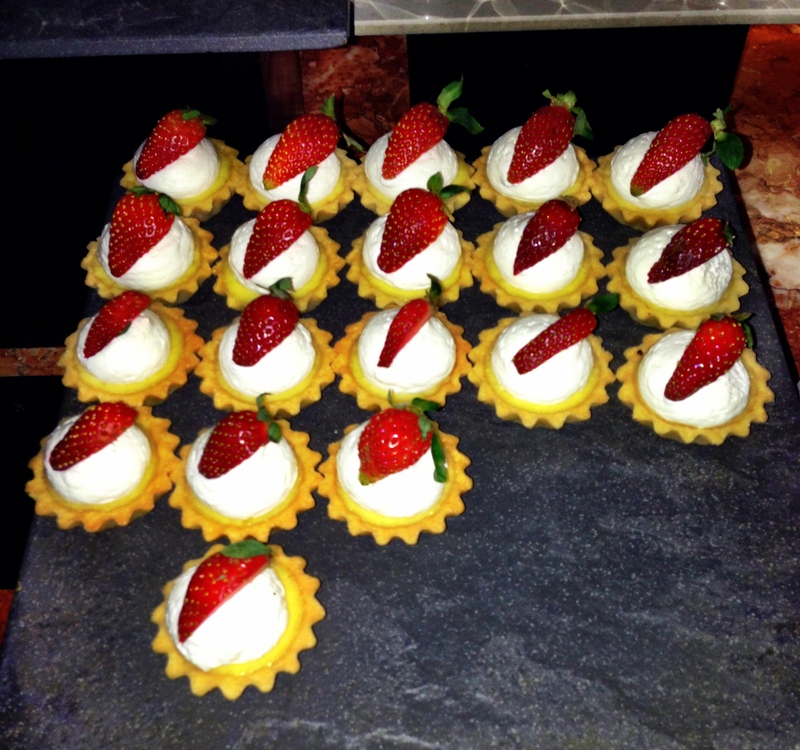 They always make the cutest little tarts. Not so good for the figure! Food was one of my worries coming here. But I obviously have loved it a lot! Sorry about all the pic’s, just wanted to keep a yummy record! But off course, the one thing that was the absolute best food item in the Philippines was……. Good ole’ Vegemite on toast! 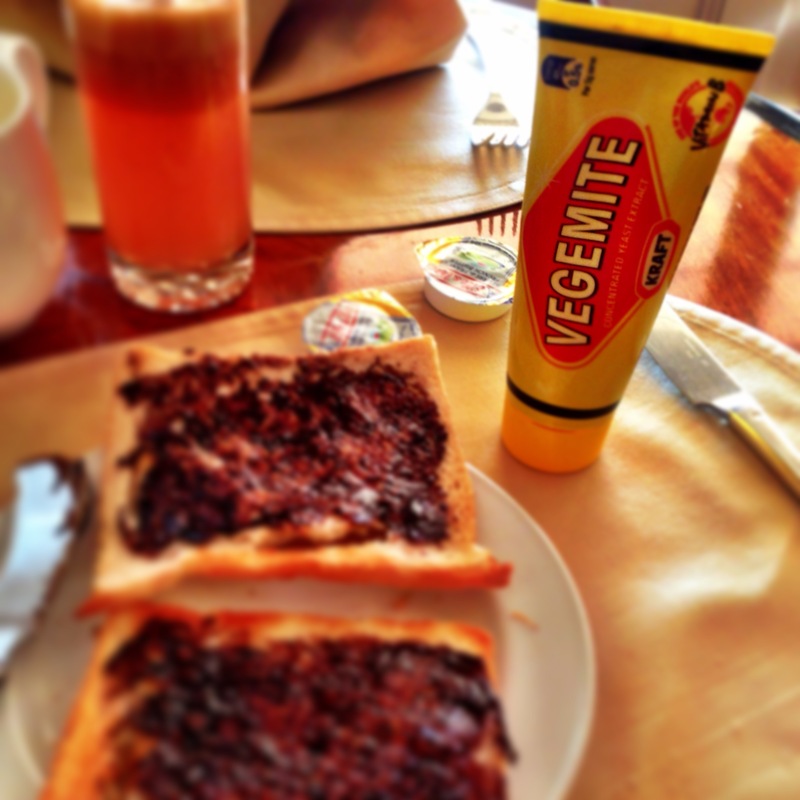 It’s great that you have experienced the food of the locals, BUT the Best thing is Good Old Vegemite!!! I’m so glad I can get it here in Canada. Don’t have it often but always keep a jar in the cupboard!! Yummy on toast or Fresh bread or crumpets!!!! Can’t Leave home without it!! !